If you work from home or are having a home based business; it can be a great thing and if anyone discouraged you, they are WRONG, and here’s why. In today’s scenario there are a lot of unconventional fields and a career options. Also with the ever increasing penetration of the internet, the office space has extended to the homes of the individuals and businesses are being carried at the click of a button and around the world; at times even without meeting clients face to face. 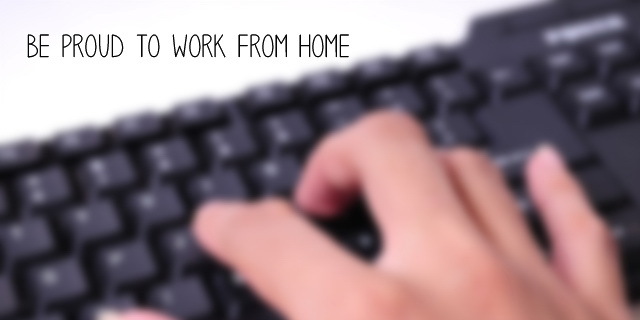 Work from home opportunities are more than ever. With all this there are lot of genuine ways to earn some money without actually having to go to an ‘office’ or sitting in a cubicle. Also, while the economy is slowly crawling back to normalcy, the past few years seem to have taught the companies that contractual ‘labour’ is more profitable and hence there are more jobs that are project and contract based, leading to a lot of people spending a few months off the pay-roll or having to do the work from home and only visit their offices for presentations, submission etc. There are also a lot of business opportunities that are mainly home based businesses and lot of people, especially new moms or even dads, wanting to be around their babies’ growing up; are opting for. There are lot of jobs like writing, designing, online marketing, legitimate MLM companies, insurance agency etc, that are providing genuine opportunities to work from home or have a home based business. Also there is a spurt in Entrepreneurship and lot of young and old professionals boot-strap and hence cannot invest in a separate office space to run their business, at least while they are starting off, and this leads to them making their home as their office. Also Read: Why there is no such thing as "Right Time for Investing"? Whatever the case maybe, if you too are working from home or running a home based business, you will know that it requires hard work and dedication to do what you are doing and earn a living out of it. In fact work from home requires more focus and hard work compared to working in an office, since there is that comfort level of your home and there are too many distractions to fight to meet the deadlines, handle the household responsibilities as well as handle clients, and make sure that the money is good enough to meet the monthly expenses. All in all you are no less hard working, dedicated and focussed than your office going counterparts. So why be ashamed or look down on it? There are often people around, friends, relatives, who keep insisting to take up a job and their words are “this won’t last long, you need something stable and long term… take a job, even if it pays a little less, you will grow in sometime…..”. There are individuals, men and women, who are bloggers, entrepreneurs, writers, designers or are running a small business from home, who earn handsomely and at times more than what their previous day jobs used to pay; so why is it so bad? I mean, what is the guarantee that the “Stable Job” will actually be a “Long Term” one? There are even large multinationals cutting costs and cutting jobs so who is to say that a job in a good company is going to see you through in life? As long as you are sincere in your efforts, hard working and focussed on the end goal, money will come. And even if you have an irregular income, you can still plan ahead and make your money grow even on an irregular income. All it needs is a bit of planning. So if anyone tells you that work from home is not the way to go, just give them a smile. There is no shame in a work from home job or running a home based business irrespective of whether or not you are a Man or a Lady. If you are a work at home dad watching your baby grow, while still being able to take care of the financials; my friend what else you need in life. Those moments won’t come back and once kids grow up, they have their own lives. Same goes for the mothers, but for Dad’s mainly because if a man sits at home he is looked down upon by people who do not understand a thing about what kind of work he is doing. This even happens for single male entrepreneurs working from home. Their family will often say “…son take up a job, who will want to marry a man who sits at home…” It is really sad since for a lot of us, the Nature of Work does NOT matter so much as the Place of Work does and even that is attached to social status. There are people stuck in boring and bland jobs that they do not enjoy but are happy that their office space has these ‘facilities’ and what a great big office they go to. It is a sad mindset; which is best ignored. That should help every teen having a same drill mindset running and hunting for a common job!